« It’s Always The Last Place You Look…. One Pru in a tub: The little one took her first bath today. It was just time. The look on her face in this picture vastly overstates how much she enjoyed this experience. Still, she’s clean, which isn’t nothing. Pru preps for her bath. She has very intense visualization exercises she uses to get ready. Here, she’s using an imaginary bench press (the camera case, seen in the background, is her spotter). 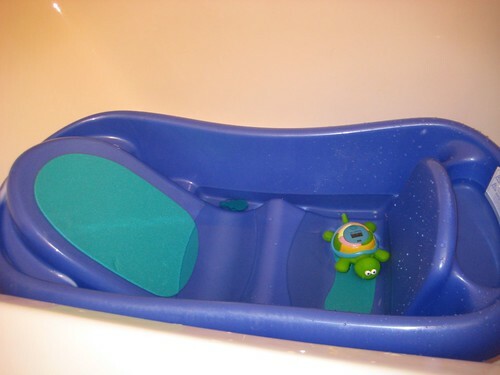 One baby tub, ready for use. The cute little fellow on the right is Tintin the Temperature-Telling Turtle (or so in my mad passion for alliteration I have named him). Once he gave the green light (literally, in this case – there’s a little light on his back that flashes green when the temperature is in the safe/comfortable range for the little one) we got things rolling. Here’s a photo that more accurately demonstrates how Pru reacted to her bath. Still, I managed to give her a good scrub-down. Two things I want to make sure are known: One, despite appearances, I am not naked in this photo; I’m wearing my Sponge Bob pajama pants. Two, my baby doesn’t make fun of my bald spot. If she’s mature enough to do so at less than two weeks, don’t you think you are, too? All good things must come to an end, and baths are no exception. Pru took a little more kindly to being dried off than she’d to the bath itself. I suspect the finger sandwich she’s feeding herself in this picture helped. That’ll do, turtle, that’ll do. Clean and happy(ish) after an exciting first bath adventure! 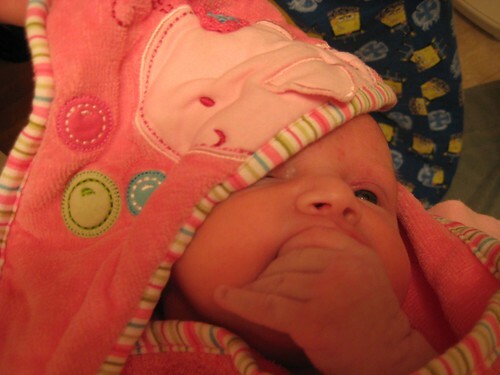 Those first baths are something like a foretaste of parenting an adolescent. Glad to see you had the right stuff! Now you can comprehend John McCain’s waterboarding issues. Aww. Objectively cute baby. 🙂 Congratulations, Angus (and Sarah, of course, although we’ve never met). – I could have written every word of this post, Abi. We live in a small flat in London, but I have my man and my (nearly) two year old son Maximillian. I ptagohroph things I love (again, not as often as I’d like) but life’s not bad, all in all, and I can’t honestly complain! Nice tub. I picked out the same one in 2004 and it’s now serving the third baby, none the worse for the wear. 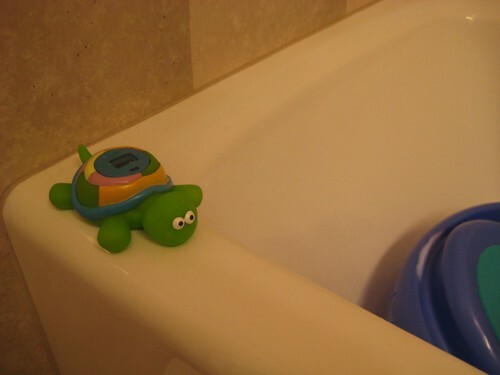 We never had the turtle, or even particularly used the temperature sensing drain plug, which IIRC changes color. In fact, we seldom used the drain anyway, just dump the water out. If the tub has a flaw, it’s how hard some of the nooks and crannies are to get truly clean. We’re not that fussy about clean; babies need the flora to develop their immune system. Once in a while, though, we hit it with Clorox wipes or their equivalent. It’s amazing how short the time you use the baby towels before switching to regular ones. Ditto for baby wash cloths, which I believe we didn’t use at all after the first or maybe second one. It’s also amazing how fast the time flies before the baby tub gets put away and they go in the big tub. That’s aside from taking baby in the shower with you, which for all of them was like Best Thing Ever. Sometimes Deb will take the baby in and after a few minutes for washing and enjoying the water, I’ll come get him from her. Henry likes that perhaps even better than a bath. The girls, as I recall, were less excited about that and, while they liked it, preferred the baths.